Though the recent release of her latest novel, Ghost Hunters of Kurseong, a children’s book, has kept Shweta Taneja busy, she was kind enough to take time off her busy schedule to spend some time answering a few questions and discussing her inspirations, writing and her new book. Q. How did you get into writing? Is this something you’ve always known you wanted to do? Well, I’ve been a journalist. Journalism happened completely by chance, I wasn’t planning it. I wasn’t very ambitious about it in the beginning. Once you get the hang of things, you want to kind of set out into something that’s more challenging for you as a person. It was a conscious choice one fine day; it wasn’t there since the beginning of time for me. It started off during my journalism days in Delhi. I just decided that I wanted to write this book I had in mind. After that, it was a matter of actually just sitting down and writing it, which didn’t happen for a couple of years. It was in my brain for a long time. When I shifted to Bangalore, I was between jobs, so that’s when the book shaped up and it wasn’t the book I was planning to write at all. The first book that I was planning to write didn’t go anywhere, so that was a failure. Maybe I’ll pick it up later, I don’t know. So it just happened. It was the biggest challenge I could set myself, it still is! I mean, as a journalist writing about somebody else is easier; but creating those people, I think, is the most challenging thing you can do as a writer. Q. So what would you say you are more passionate about – being a journalist or being an author? I’m very passionate about creating stories. So right now, at this time in life, I definitely love creating characters and seeing them through the various adventures I put across to them. Shwetha Taneja at the launch of her book, The Scull Rosary, at Mumbai Comic Con. Pic courtesy: Shwetha Taneja facebook page. Q. What was your experience when your first book came out? Shweta Taneja: Well, my first book was a graphic novel called Krishna: Defender of Dharma. It felt surreal in a way, because I had worked for three to four years towards this certain direction of writing books. It’s quite beautifully done. As a graphic novel, the credit lies more with the artist than the writer. I think the artist there (Rajesh Nagulakonda) did a beautiful job. It was a story that kind of got me thinking more on mythology as well, so I’m thankful for that. Just holding that book in my hands was a marvellous feeling. It’s like holding something that you’ve created or helped create. It’s just the most beautiful feeling ever. I never thought that I would get that. Q. What was it like collaborating with another artist? It was eye opening in a way. I’m a very visual writer as well. I know pictorially how things look. So when I was writing the script for Krishna, there was a visual imagination that I had made and it wasn’t the regular Krishna imagination at all, and if you see the book it’s the regular Krishna. It was actually quite futuristic, because I was looking at Krishna’s story as a science fiction. But then you realise that in a graphic novel, because it’s a collaboration, it’s the artist’s vision that also comes into it. In a way, I would say it completely changed my vision; in a way it slightly destroyed it (not necessarily in a bad way), and also took it in a different direction. So that was very fascinating for me. The book I was holding was kind of mine, but not really mine. It’s like wearing somebody else’s clothes. Q. So would you say you prefer writing novels by yourself? No – I love both processes. Novels definitely give you more control on the storyline and everything else, but collaboration with another creative person takes you personally and creatively in a different direction, which you hadn’t thought was possible. In December, another one of my graphic novels releases. This one’s called The Skull Rosary and this is with another artist and it’s an Indie Publisher, Holy Cow, that we’re working with. There are a series of five stories in that book, and these are five different artists as well and each of them are taking it in a completely different direction. Some I might not personally like or dislike, but it’s definitely a different way of looking at the story. So it’s fascinating in a way. Q. When it comes to your personal inspirations and influences, who would you say your favourite writers are? I, right now, am very much into mythology and fantasy, so I’m reading a lot of hundred year old books on mythology and I’ve seen the way mythology has kind of changed, Indian mythology specifically. In terms of fantasy writers there’s Neil Gaiman that I love, and Terry Pratchett; they are my regulars. I’m also exploring literary, sort of fantasy jaunts, because it’s good to read different stuff. Right now I’m going to Silence of the Lambs and I had never read the book and I find the author writing it so tight. Every author has his or her own style of expression, which kind of opens your own head up a bit as a writer yourself. So you have to explore. I’ve just gone through Hilary Mantel and I’ve gone through The Blind Assassin in the past few months. Both of them have such different styles. I’ve written a book which is a contemporary fantasy based in Delhi, which I’m trying to find a publisher for. Let’s see how that works out. Shweta Taneja’s first book for children is an exhilarating detective tale, drenched in supernatural happenings. In the attic of the home he recently moved into, twelve-year-old Kartik finds an old video cassette that belongs to the mysterious DPRS; a cassette that is linked to the run down Iyer Bungalow and the Iyer ghost that terrorises the citizens of the little mountain town, Kurseong. Along with his new friends, Opus and Tashi, he is flung into a rollercoaster ride as they find themselves delving deeper into the mystery of the Iyer ghost. Are there really supernatural forces at work or is it something far more sinister? Q. In relation to Ghost Hunters of Kurseong – the characters are really lively. Are they based on someone you know or yourself? That’s the fascinating part of fiction for me, because through the characters, I can do things I wouldn’t do. For example, this book based in Delhi, this is a girl who is a tantric and she is solving a supernatural mystery. She sleeps through the day and walks around at night. Being a girl, being in Delhi and being in your twenties and solving a supernatural mystery at night is a dream for me. So I think I completely lived through her character. Q. How did you get into writing for children? It happened by chance. Actually, this book was meant to be another graphic novel. I had written it like that. That’s why it’s so visual. That project didn’t happen, but by that time I had already plotted the three kids and they were like “Okay, we need a mystery”. This was, say about, four years ago. I was doing another project with Centre for Internet and Society wherein I was editing their research books. So I just decided that within those six – eight months of that project, I would write this. I didn’t plan to get it published. I just wrote it because these three kids said “Write us, write us.” It was something that I wanted to do because I had already begun the story and I was curious as to what happens inside the story. When you’re plotting, you see the story from the outside perspective, but only when you’re writing, do you know what’s happening up close – what the kids are doing on the roads of Kurseong. Kurseong was such a fascinating place to put them in as well. I just wanted to write them. Q. So what do you find scarier – people or the supernatural? I’ve written a lot of supernatural-paranormal stuff. I’m currently writing a book which is based on the paranormal again, somewhat like Ghost Hunters, but in a college environment. I think, for me, the supernatural and the paranormal are the ‘others’ in society. So it’s not whether the humans are scarier or the ‘others’ are scarier, because if you look at the ‘others’ in our society, which are the caste based ‘others’, religion based ‘others’, political based ‘others’ – you’re a community. So I look at the supernatural as well as the paranormal as communities. There might be good there, there might be bad there. Just like in any other community; but because they are the ‘other’ community, the clash that happens between the two (supernatural and human), the distrust or the trust, depends on how you react to a ghost that walks by, for example. He or she might not be interested in attacking you, but it’s very much your reaction to the ghost. Q. You’ve written a few books so far and are working on a few more. Do you have a specific favourite of yours? In terms of my books? Well, this tantric in Delhi, which I plan to take as a series is something, I would say, is closest to my heart, in terms of what I have wanted to explore. It again talks about supernatural adventures. It talks about their rights – supernatural creatures’ rights and human rights. That’s something that I would want to explore more in writing. I don’t really have a favourite favourite yet, but that character has come out the strongest for me. If you wanted to put it that way, she is kind of my favourite. Q. In relation to your fans, has there been any interesting incident or has there been anything that’s been said to you that has really stuck? A kind of funny incident was an email from one of the ISKON (International Society for Krishna Consciousness) followers, after Krishna was published. He wrote in to say that he was planning this play for ISKON and that he’d like to take my help. I found that really out of the blue. I found it hilarious that he had come to me for help. It was unusual. Shwetha’s new graphic novel The Skull Rosary was released in December 2013. A book on tantric mystery based in Delhi is the one she’s working on right now. At 36, this Bangalorean has authored several books, including one on actor-director-producer Aamir Khan. Her next book is going to be on Bangalore. 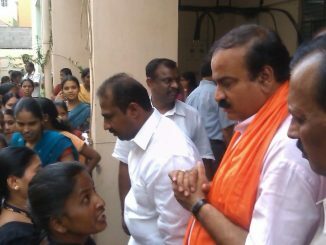 After chasing him for a long time, Citizen Matters finally caught up with Ananth Kumar who gave us an interview. Here is the output!